Prime Minister Ehud Olmert referred Thursday to the Baker-Hamilton report, which called for an Israeli withdrawal from the Golan Heights, and said, "We have a different opinion, and to the best of my knowledge President Bush also has a different opinion on the matter." Olmert said he objected to its attempt to create a connection between the Iraqi issue and the issue of the Middle East. According to him, as far as he knew, Bush also did not agree with the committees report. Speaking at the Editors' Conference in Tel Aviv, Olmert added: "I don't know what the president decides to do with the report, I can only say that the views I've heard from the president and senior administration officials on the Syrian issue were that they did not see a possibility for an American-Syrian negotiation or an Israeli-Syrian negotiation. I count on his judgment and responsibility." The PM mentioned that at least two Israeli prime ministers had advocated partial or complete withdrawal from the Golan Heights in the past. However, he said that "in my view, Syria's subversive operations, its support for Hamas – which may be what's preventing real negotiations with the Palestinians – do not give nuch hope for negotiations with Syria any time soon." "The question what we'll give to the Syrians interests me less than the question what they'll give to us," he stated. In response to whether he agreed with estimates that there would be a war with Syria in the coming summer, Olmert said that he did not think Syria was interested in any military action, and added that Israel felt the same way. Referring to his "peace speech" at the annual memorial service for Prime Minister David Ben Gurion last week, he said, "I believe in the things that I've said. When we reach a negotiation based on the implementation of the principles that Israel has set, we will be prepared to take long reaching steps in order to allow for an agreement." Olmert expressed his hope that a meeting with Palestinian President Mahmoud Abbas would soon take place, without prior conditions. When asked whether he though Israel was repeating its mistakes in Lebanon allowing terror organizations time to recover through the ceasefire, Olmert replied, "We won't let that situation develop in the south, and in recent months we have operated in an unprecedented way." He continued, "I'm happy with the ceasefire and I think it’s a step we had to take. Of course we won't accept a situation in the Gaza Strip of rebuilding forces that could threaten the well being of part of Israel." Turning his attention to the Iranian issue, the PM said that "any compromise that will lead to Iran being unable to create unconventional nuclear weapons is a step in the right direction." "This matter has been our top priority for some time now, and we are acting in various ways in order to deal with it. This is not just an Israeli matter," added Olmert. Olmert said that the risks Israel faced today were ones it was capable of dealing with even more efficiently than in any other time since its establishment. 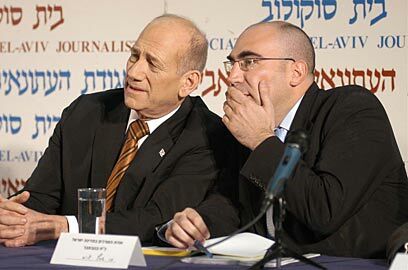 See all talkbacks "Olmert: No negotiations with Syria any time soon"